Turning food into french fries instantly makes them more appealing..case in point? 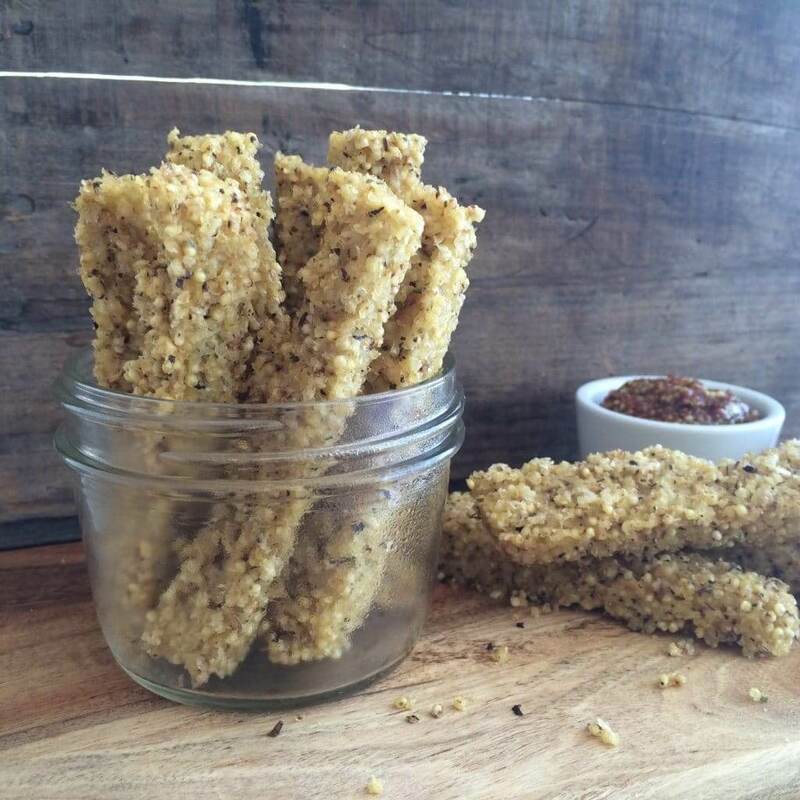 This baked millet polenta fries recipe. If you’ve read my blog for a while, you know I’m always talking about how the texture of food totally changes everything, and can turn a food you normally wouldn’t touch into one that you crave (see Sweet Potato Spaghetti). Polenta is simply cornmeal that’s boiled into a porridge like consistency, and then cooled into a log shape that can then be sliced. Boiled and solidified cornmeal doesn’t sound exciting, but the texture and consistency of that stuff makes it just heavenly. 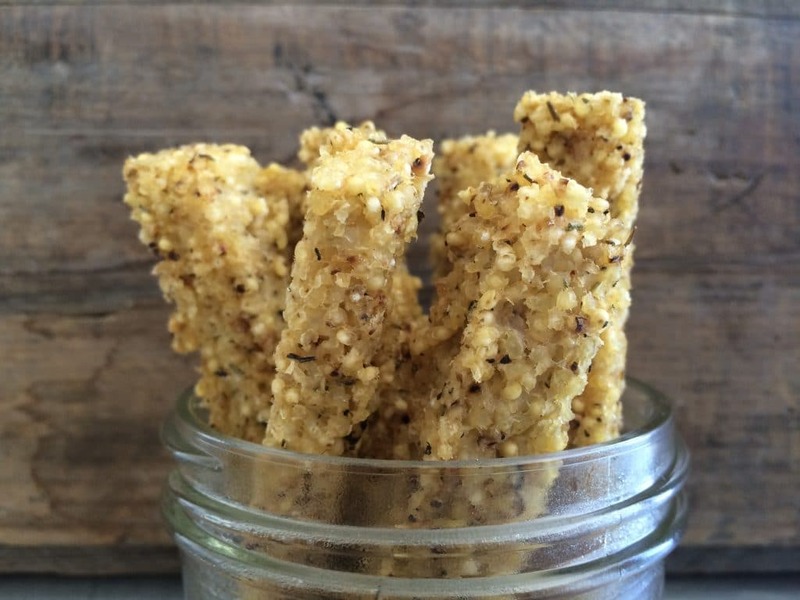 This recipe is made with millet instead of the typical corn. (I’m not a huge fan of corn, although I do have it on occasion, and when I do, it’s always organic, to avoid GMOs). If you can find organic corn polenta, you could use that, although cooking times may vary. 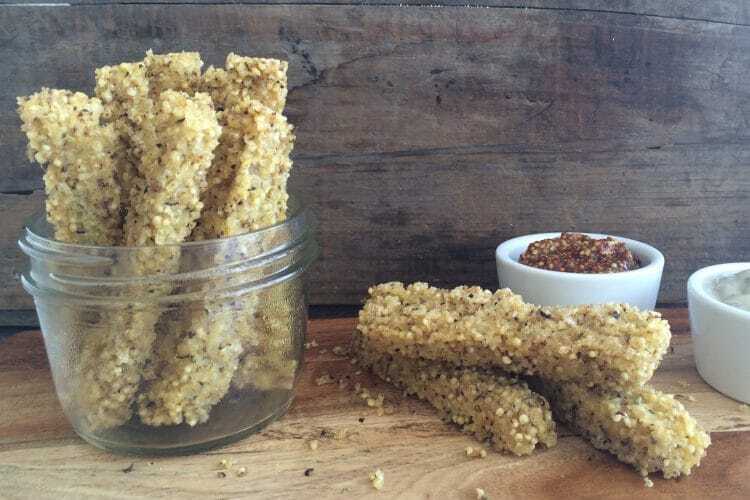 Millet is a whole grain that resembles quinoa when dry, but when cooked, tastes much different. It can become fluffy like rice or creamy like polenta, depending on how much water you use to cook it. And when you dry roast it prior to cooking, it develops a delicious nutty flavor. 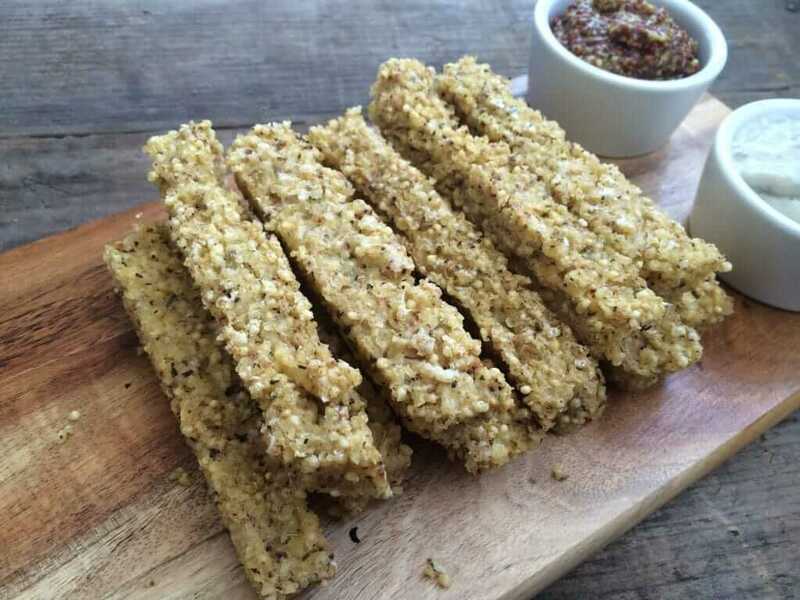 This recipe for baked polenta fries is easy to make and would make a fun side or even a healthy party appetizer. *NOTE: For most healthy people, a small amount of millet here and there can fit into an overall healthy diet. 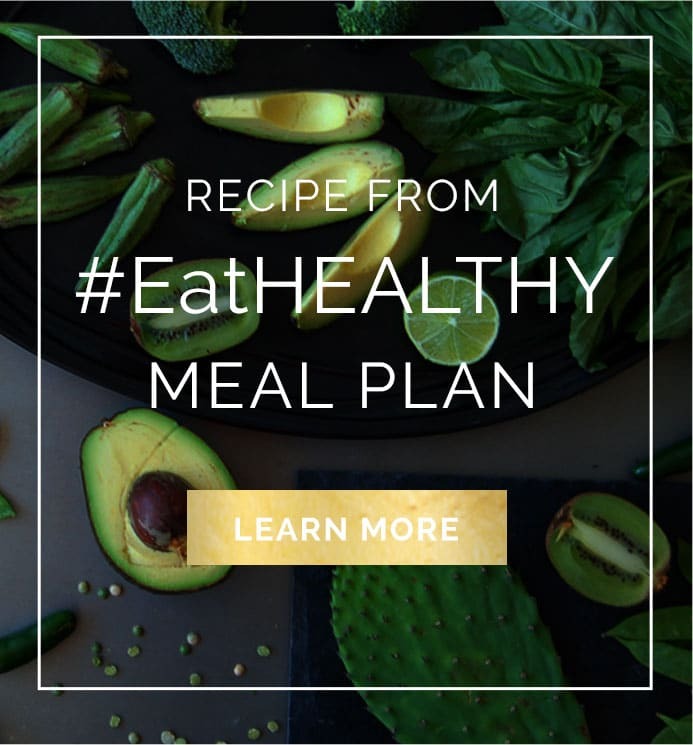 However, for people with thyroid issues or iodine deficiency, it’s best to avoid millet, as it may produce goitrogenic effects and cause issues with the thyroid. (source). In a dry saucepan, toast millet by heating the pan over medium low heat, than adding the millet. Let it toast for 3-5 minutes, until it becomes fragrant (like popcorn!) and the grains turn a golden color (be careful not to burn them). Then, carefully add in the water (it will sputter since the pan is hot). Stir in salt and herbes de Provence. Turn the heat to high and bring the water to a boil. Once it's boiling, cover the pot, turn the heat down to low, and let it simmer for about 15 minutes, until all the water is absorbed. You can stir it occasionally to break up the grains and create an even creamier consistency. Once water is absorbed, remove the pan from the heat and pour into a rectangular glass tupperware or baking dish, to let it cool into this shape, for at least 10 minutes. Carefully flip over the baking dish onto a cutting board, and you'll be left with a block of millet polenta. Slice it into evenly sized "French fry" shapes. Brush each fry lightly with a little olive oil on each side, and place on a baking sheet. Bake for 40 minutes, flipping the fries half way through. Serve with ketchup or dip of your choice.